I have been trying to think of ways to dress up different accessories lately and flowers keep on coming to my mind. But I know that not everyone loves flowers so I wanted to find other little decorative ideas to finish off special gifts and projects I have been working on. I was browsing Pinterest one day and seen a little bow made from t-shirt material and it seemed so simple to make. I am always looking for ideas in which I can use up my scraps and be thrifty, especially since I have a few t-shirts left over from my bangles from bottles project (click to go to the tutorial post). Then I realised I would have to sew. I do not really like sewing at all. 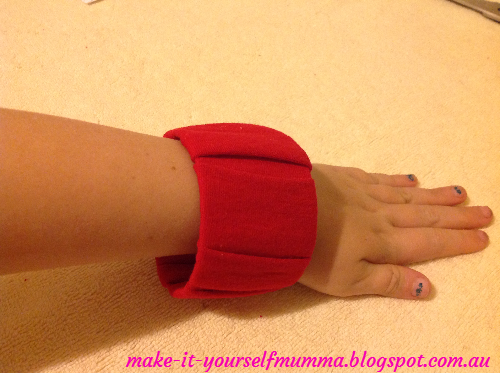 I do not own a sewing machine (I want to buy one, they just really scare me as I don't know what to do when something goes wrong) and find hand sewing a little tedious so I usually avoid it at all costs. I temporarily put the project on hold, til I was feeling a little more brave and patient. Then I got to thinking, I have recently just finished knitting a little flower to try to accessorise a few little things for my daughter, why not try to knit a bow as well? 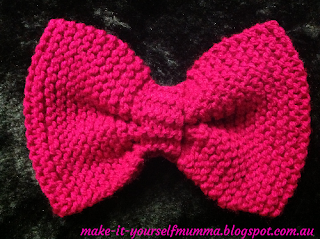 So I took the same idea and created my own knitting pattern. 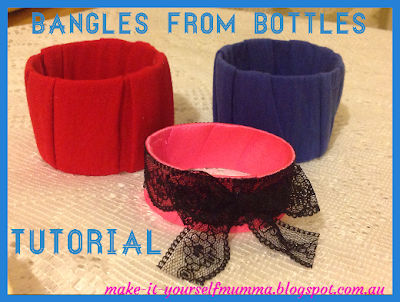 I couldn't stop at one, I have made 3 different designs in 3 sizes which I will share with you here. The first bow is a simple garter stitch bow which is great for those who can follow basic knitting steps. 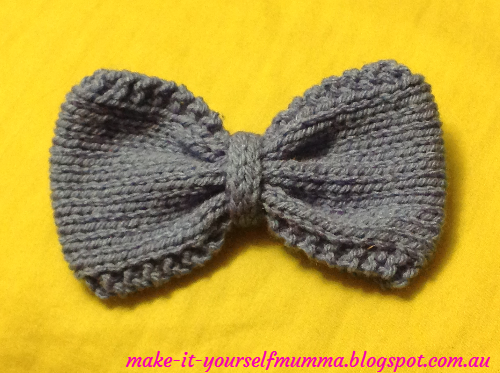 Then there is the rib stitch bow and finally there is the stockinette bow with selvage edges. It is perfect knitting weather at the moment as it's a little chilly at night so I can sit on the lounge with a blanket on my lap clicking my needles away. NOTE that you will need to know how to knit for this project, if you do not know how then you can always ask someone to teach you (my wonderful mother taught me years ago) or teach yourself by watching videos from the net. 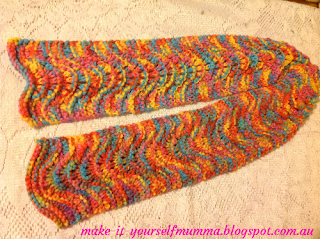 Youtube has alot but so do some of the other knitting sites. If you find a video that is not clear, google to find another. I find it easier to learn whilst watching someone showing me and by doing this online you don't have to bother them to show you over and over again. I might teach myself to crochet this way soon, there are so many cool patterns out there that I just can't make as I don't know how to crochet yet. This pattern here is for the large garter stitch bow (pink) which measures 15.5 cm total length and 10.5 cm height (when finished). 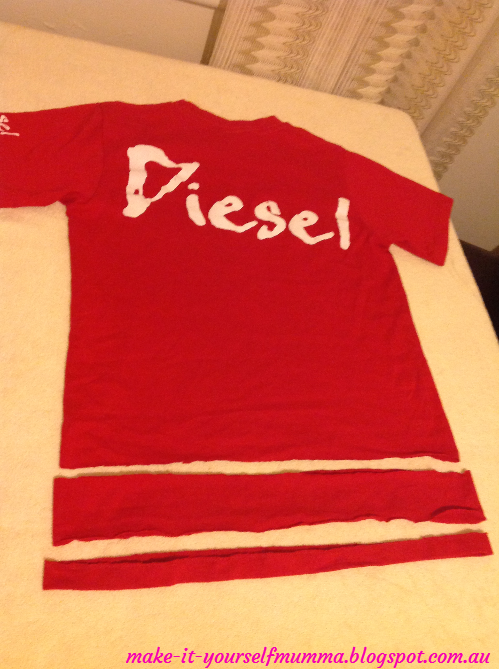 Keep reading below for other designs and measurements or experiment to create your own. Cast on 20 stitches (knitwise). Leave a long tail at begging. Knit across all rows for 100 rows. Cast off (knitwise). 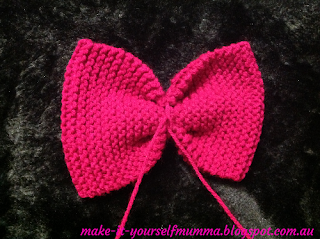 Make sure you leave a longer tail as you will use this to sew up the bow shortly. Otherwise you will have more loose ends to hide. Cast on 5 stitches (knitwise). Leave a long tail at the beginning. Knit 20 to 25 rows, you will want to stretch this part over the middle of the bow and have it long enough for the two ends to just fit so measure this as you go. Cast off (knitwise) and leave a long tail. 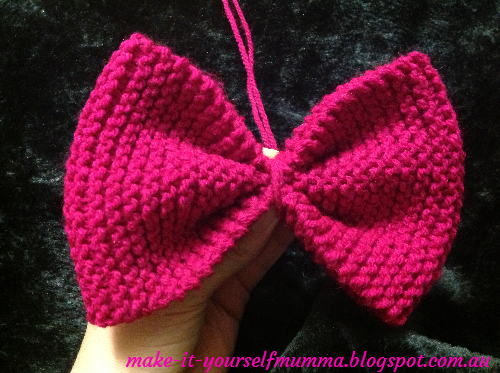 Now you have knitted the two pieces that you need to make the bow. Next you will need a yarn needle to put them all together. 1. Sew the ends of the big piece together using one of the tails (using any joining method you want). Knot to secure but don't cut the ends off just yet. 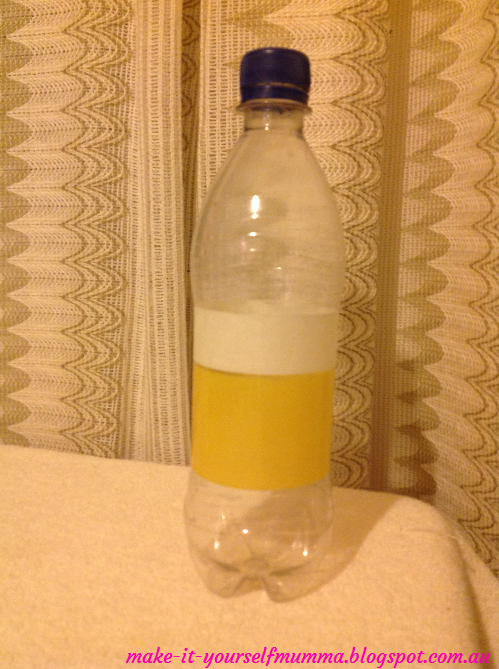 This will make a tube shape. 2. 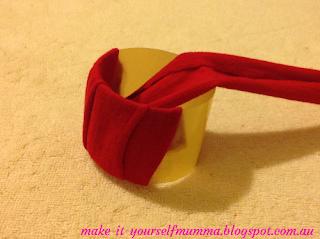 Pinch the middle of the main part together to form the bow shape. Take the tails and wind them around the centre of the bow firmly once or twice. Tie at the back. Now you can cut the tails off. 3. 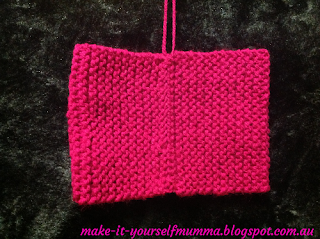 Now stretch the second piece of knitting over the middle and sew the ends together at the back. Knot to secure. You can cut the tails off if you want now or you can use them to secure the bow to another object if you want. The second bow I created was a ribbed bow which measures 8.5 cm total length and 5 cm height (when finished). 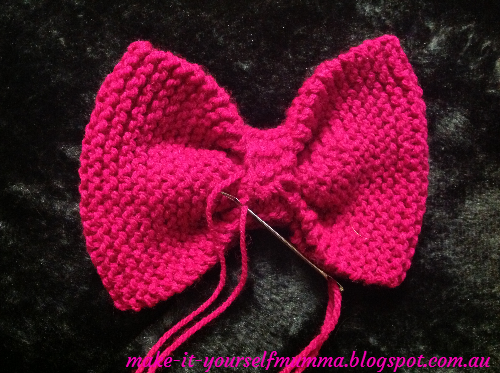 I will give you the pattern of this one, you just have to put the bow together using the above method. Cast on 10 stitches (knitwise). Leave a long tail at begging. 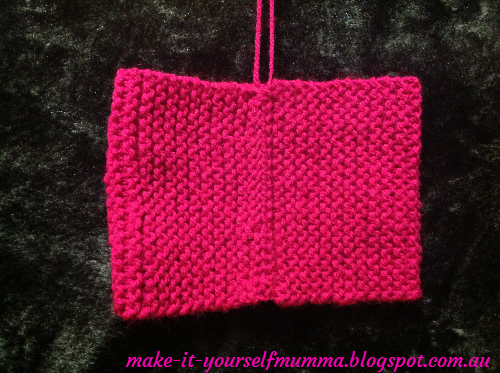 *Knit 1, Purl 1 (repeat from *to end of row). Cast off (knitwise). Leave a long tail at the end. Cast on 2 stitches (knitwise). Leave a long tail at the beginning. Knit 10 to 15 rows, you will want to stretch this part over the middle of the bow and have it long enough for the two ends to just fit so measure this as you go. Cast off (knitwise) and leave a long tail. The third bow I created was a garter stitch bow with selvage edges which measures 13 cm total length and 8 cm height (when finished). I used the selvage edges to prevent too much curling as the stockinette stitch pattern tends to curl quite alot. 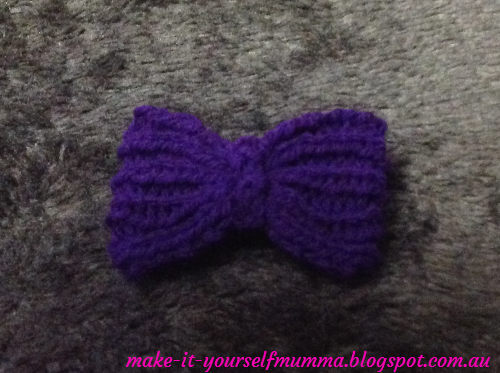 Put the bow together using the method above. Cast on 15 stitches (knitwise). Leave a long tail at begging. 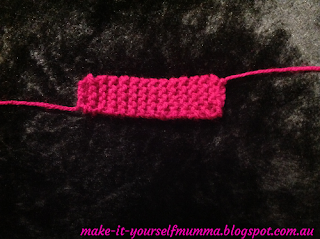 Row 2: Knit 2, Purl to last 2 stitches, Knit 2. Repeat these 2 rows for a total of 70 rows. Cast on 4 stitches (knitwise). Leave a long tail at the beginning. 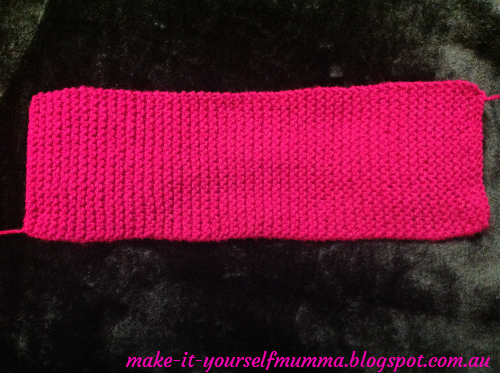 Row 2: Purl to end. Repeat these 2 rows for a total of 15 to 20 rows, you will want to stretch this part over the middle of the bow and have it long enough for the two ends to just fit so measure this as you go. Cast off (knitwise) and leave a long tail. My young daughter keeps wearing my scarves whenever she sees them, including when there is one around my neck. She usually wears them and puts them somewhere in her room instead of putting them back away so I never know where they are. So I thought I would make her a new one of her own, hopefully one that she would want to wear instead of mine. 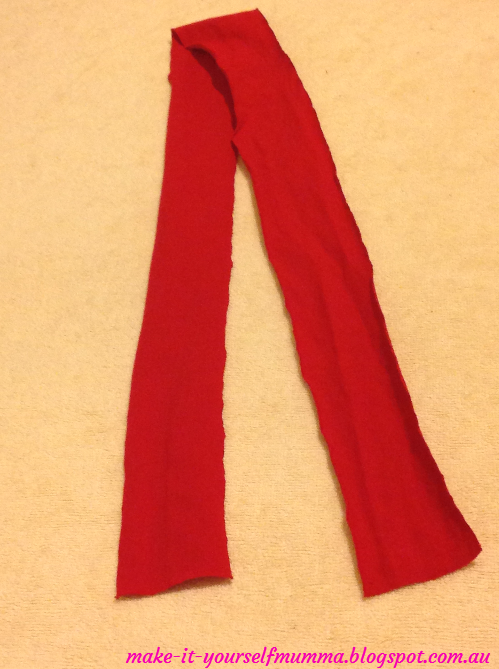 I mean, it would be lovely to be able to wear my own scarf on those chilly mornings when I leave early for university. 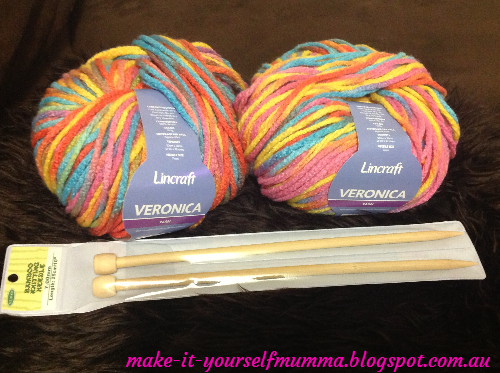 I went to my local Lincraft store and seen a rainbow yarn that I loved straight away, I knew my daughter would too. It was a chunky yarn and so I thought about knitting in a plain pattern, but I have been wanting to knit a lace pattern for a little while. 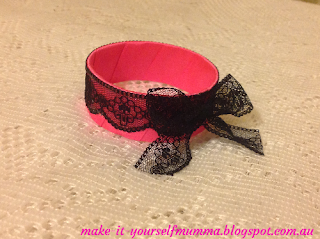 So I did an internet search and came up with an easy and cute pattern. I tried it out and it looked great. You can find the "Old Shale" pattern that I used for this project HERE. (Keep scrolling down the page to find it). NOTE that you will need to know how to knit for this project, if you do not know how then you can always ask someone to teach you (my wonderful mother taught me years ago) or teach yourself by watching videos from the net. 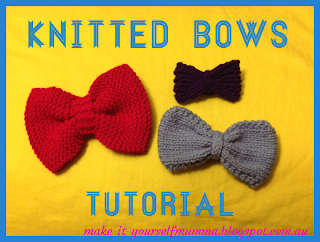 Youtube has a lot of video tutorials but so do some of the other great knitting sites. 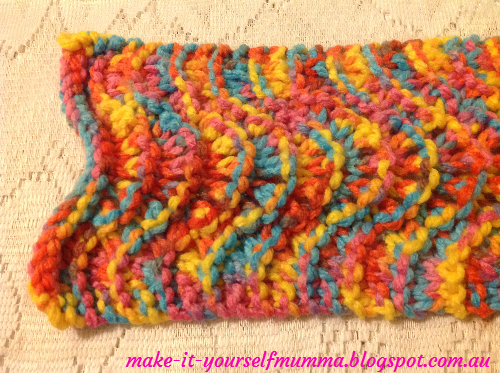 I followed the pattern exactly and loved it so much, it was so easy. I bought 2 x 100g balls of "Veronica" wool but only used about one and a half balls. I am planning on making another item with this wool for her so will use this and buy some more shortly. 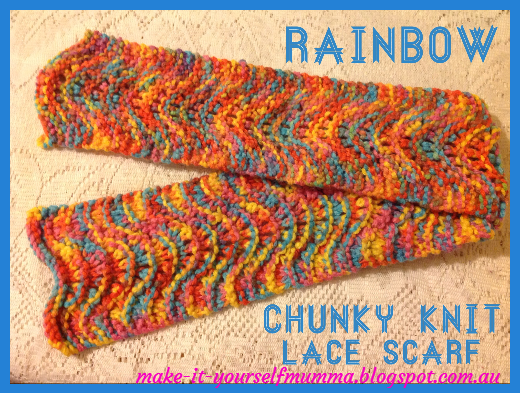 I used size 7 needles (as the label of the wool suggested) but I am a very tight knitter so I probably should have used a size or 2 bigger. It would have made the lace pattern a bit more visible as well I guess. I didn't block this piece as I have read that acrylic wool doesn't always need it and it wasn't a piece that needs to be an exact size. Plus my daughter just would not have been very patient for that sort of thing to take place. It was a simple pattern to follow and it took me only a few hours, my favourite kind of project. 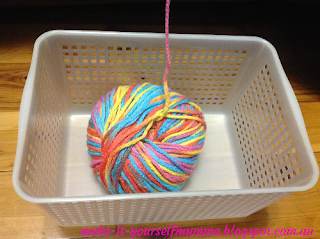 Here is a quick tip for stopping your ball of wool from rolling all around on the floor as you knit. 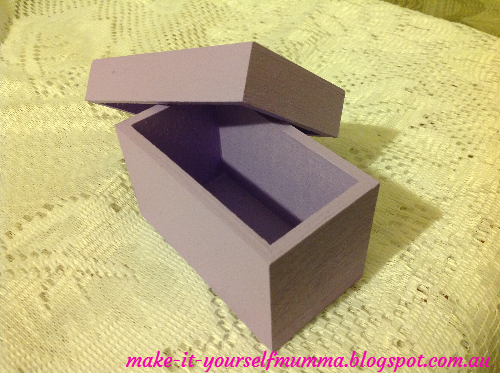 Place a small box or container (a shoe box is ideal) either next to you or on the floor by your feet. Place your ball of wool inside and knit as normal. The ball will roll around in the box instead of on the floor, keeps your wool clean and in reach at all times (I know that I absolutely hate it when my ball of wool travels across the room all of a sudden). In my last post, I showed you a cute little gift box that I made to give to my mum for mother's day. I wanted to put a gorgeous pair of earrings inside that I bought from my friend at Janey Jewels but I didn't want them to just sit in the bottom of the box. I got thinking and came up with a simple design for an insert that would display the earrings nicely to make a lovely gift. 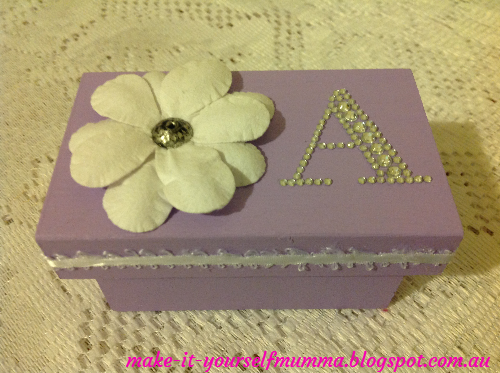 The tutorial for the gift box can be found HERE if you missed it. 1. Firstly measure the inside of your box so you know what size you need your insert to be. 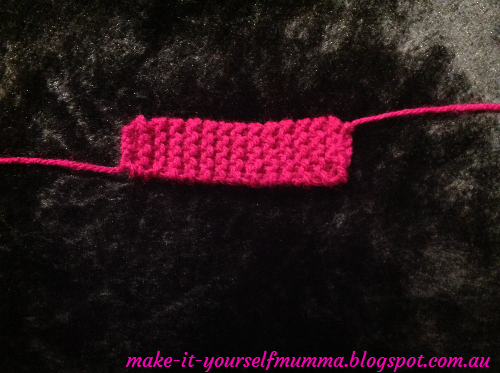 I took 1 mm off the top and 1 mm off one side so that it would fit in snugly but not get stuck. 2. Open up the sides of an empty cardboard food package (eg: cereal box) and lay it flat. Mark out your insert with a ruler and lead pencil. You want it to be as accurate as you can so you might need to use a set square to check the angles (I just used a piece of copy paper straight from the ream to check). 3. Cut the insert out carefully along the lines. Check if it fits nicely inside the box. If not trim slightly til it does fit. (please disregard the second piece of cardboard in the second pic, I was going to use a second piece but didn't need to). 4. 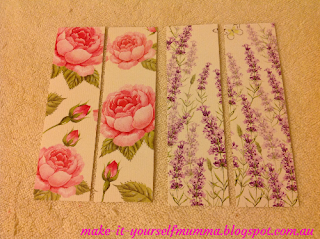 Now cut some scrapbook paper out which is about half a centimetre longer on each side than the insert. Glue the scrapbook paper on, folding the excess over the back and gluing the flaps in place. You can leave the insert as it is now (because you wont see the back when it sits in the box), but I wanted to make the back look tidy as well. I cut another piece of paper out just a little bit smaller than the insert and stuck it on the back. 5. Time to make the holes for the earrings. Mark the spot you want your earrings to hang from with lead pencil. I decided that I didn't want mine to sit exactly side by side, I thought it would look more interesting to have one higher than the other. Using a sewing needle, pierce holes in the 2 spots you marked out. You will need to be careful about what surface you use when doing this, you don't want to mark an expensive piece of furniture. I actually used my chopping board to make sure that I didn't stab myself in the fingers, you could use a thimble as well if you are worried about this (I am a little accident prone so I try to be careful about these sorts of things). 6. Thread the earrings into the insert and place rubber backings on the back if you have some (this will keep them in place in the insert). Sometimes earrings will come with them, if not you can buy some from ebay for a small cost. I find it handy to have a bunch of spares, I often lose my earring backs and the rubber ones don't irritate my ears like metal ones. Put the insert and earrings aside for now. 7. Since the insert is flat, you don't want to place it directly into the bottom of the gift box, it will sink down into the bottom and look less desirable. 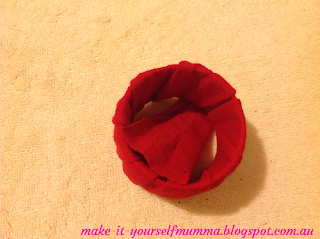 I was sitting on the lounge room floor with my daughter helping her make a cute 3D flower card (A project I will be posting soon) with scrunched up crepe paper. Inspiration then hit. 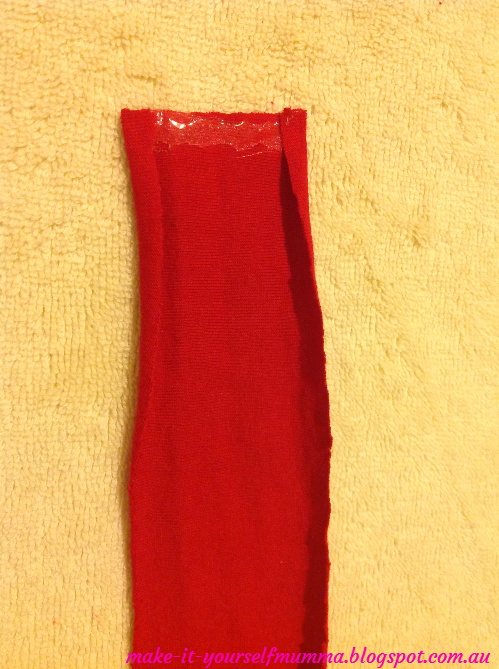 I got out some tissue paper and cut a sheet into small pieces, about 3 x 5 cm. I then scrunched them up into balls. Don't scrunch them too tightly or you will have to do twice as many. If you get bored doing this take a break and come back to it later or get the kids to give you a hand. 8. Place the tissue paper balls into the bottom of your gift box, you want to aim to have it filled up a little over two thirds of the way. Gently press the tissue paper balls to smooth them out so they are level. Now pop your insert on top and you are done. Place the lid on top and give to someone you love. I had so much fun making this and always love when a project in my head comes to life and is completed. 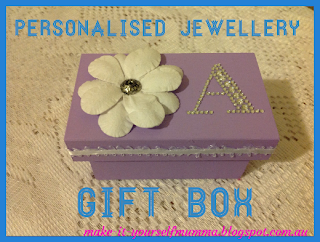 I love it even more when I can create a lovely handmade gift the I can give to someone I love. 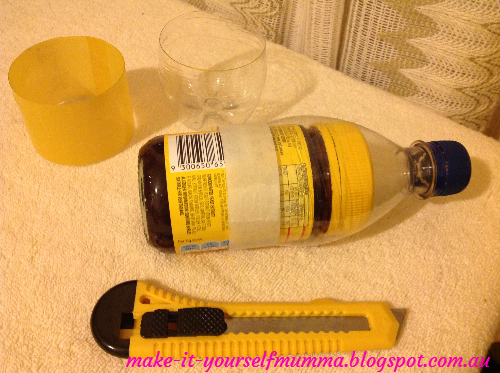 Since it's only a few days away from Mother's day here in Australia I thought I would post a few quick and easy projects over the next few days that you could complete in a short time. So if you are pressed for ideas or time (or both) these simple ideas are great and handmade gifts really are that much more special than some store bought gifts. These are also fabulous to make and sell at Mother's Day stalls at schools. 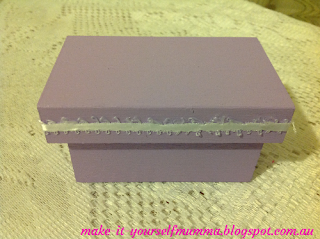 This project is a great way to use up any beautiful cards that you have kept but don't have any room for anymore. This is the reason I threw alot of my cards out, I wish now that I didn't but never thought before to reuse them in this way. I came across a pin on Pinterest on making bookmarks with Christmas cards which is from the blog belonging to the frugal girls .com. It had me thinking instantly that the same thing can be done with any type of card, for any occasion, providing it has a design you want to work with and it is a suitable size. 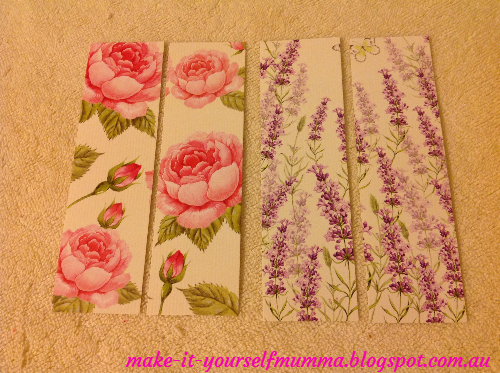 So here is my version of bookmarks for mother's day. 1. Select a card that has a suitable design (one that you have at home or one that you have bought). I bought mine for about a dollar each from my local discount store as I didn't really have any at home that I could use. The size of my cards were 21 x 8 cms. Firstly cut the back of your card off neatly along the crease/fold. If you are only using a select area of your card for one bookmark create a template the size that you want your bookmark to be using the back of the card. Trace around the template onto the area you wish to use for your bookmark. 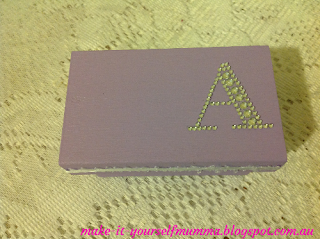 If your card has a patterned design all over like mine then you can probably create 2 out of each card. Mark out the area of the design that you want to use with lead pencil, using a ruler to make sure that the lines are straight. 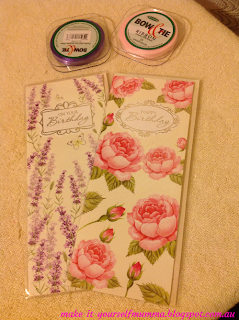 I like to use the back of the card to mark on so that there are no marks or dents on the front of the card. 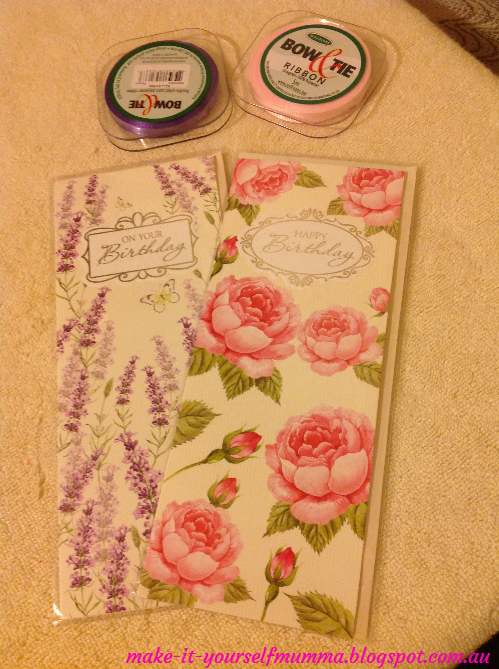 I made a line directly under the happy birthday header on both of my cards and then drew a dividing line down through the middle of the cards, creating two of the same sized bookmarks from each card. The size of each bookmark was 14 x 4 cms. You can create yours wider or longer if you wish and if your card/s permit. 2. 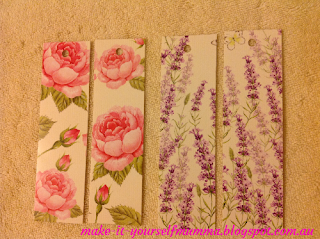 Now cut out your bookmarks or bookmarks. If you have unsightly pencil marks around the edges of your bookmark/s you can now gently rub them out with an eraser (only if you want to). 3. 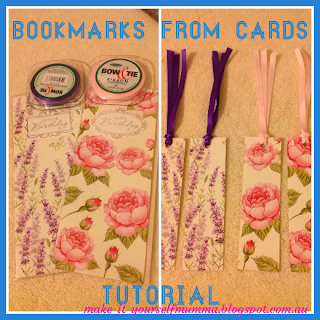 Using a hole punch, punch a hole at the top centre of each bookmark. 4. Cut 2 pieces of ribbon in a complimenting colour for each bookmark. 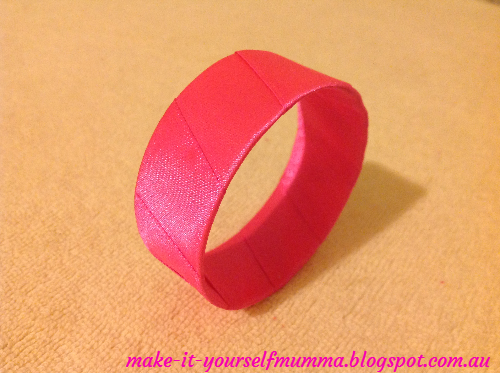 The length I used for each piece was about 26 cms in length. You can make these shorter or longer as you wish. 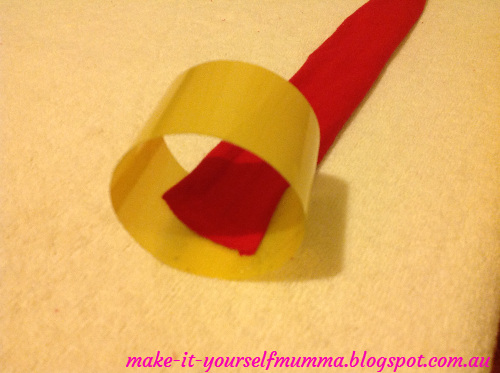 Thread all of the ends (from two pieces of ribbon) into the hole in the back of a bookmark and pull through until you have a small loop sticking out at the front. Thread the end of the ribbons through the loop and gently pull making sure that you adjust the ribbons as you go to ensure that they look like the picture below. 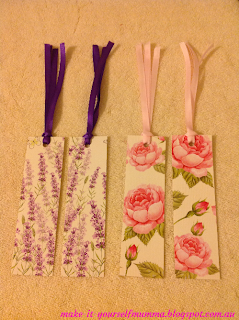 And there you go, bookmarks from cards that took you minutes to make but look so lovely and functional. This is a great activity that you can do with kids, ask them to draw a picture or write a quick message on the back to personalise the gift and make it that much more special for the recipient. I love these and will be making more for myself, I am in the middle of a few books and am always needing a few bookmarks to keep my place on the various textbooks I am reading for university all the time. If you are looking for more simple but quick ideas you can check out my Mother's Day board on Pinterest, follow me while you are there as I love to pin projects that are fun and easy enough to do. Thanks for reading, let me know if you attempt these, I would love to know how they turn out.